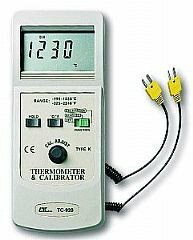 * Type k thermocouple calibrator. * Type k thermocouple thermometer. * -199 oC to 1230 oC, -325 oF to 2246 oF. * Resolution : 0.1 oC(<1000 oC). * oC /oF, Data hold. * Size : 185 x 78 x 38 mm.